Cameron Highlands, a land of breathtaking scenery with cool lush mountains peaks, waterfalls, tea plantations, terraces of vegetable, fruit and flower gardens. This attractive and magical place is tucked away at 1829 metre's above sea level among the peaks of the main range of Peninsular Malaysia. Temperature here hovers between 16 to 25. Cameron Highlands is the premier hill top holiday spot at Pahang. Discovered by a British surveyor, William Cameron in 1885, this highland paradise still retains much of the charm of an English village. Thus, European cottages are very common at in Cameron Highlands. Cameron Highlands is the smallest district in the state of Pahang, which is located in the north-western corner of the state. It is made up of 3 main townships at different altitudes. The lowest is Ringlet, 1,200 metres above sea-level situated near Bertam Valley where the soil is rich thus making this area the main agricultural centre of the highlands. Further up is Tanah Rata, which is the principal township where most of the main banks and government offices are situated. The bus terminal and taxi station are located here too. Next is Brinchang, which is about 15 minutes drive from Tanah Rata. The night market, which is open every Saturday night, features all kinds of vegetables, flowers, fruits and other products of the highlands. Beyond Brinchang, the road leads to Kea Farm, Sungai Palas, Tringkap, Kuala Terla, Kampung Raja and the Blue Valley Tea Plantation. Tea planting is the main economic activity in Cameron Highlands, with acres upon acres of land dedicated to its cultivation. There are several tea plantation located at Ringlet, whose hardy perennial plants, at a distance, produce the verdant carpet so characteristic of the highlands.One of the best known is the Boh Tea Estate, 8km northeast of Ringlet, which operates free tours from Tuesday to Sunday, usually at 11am. 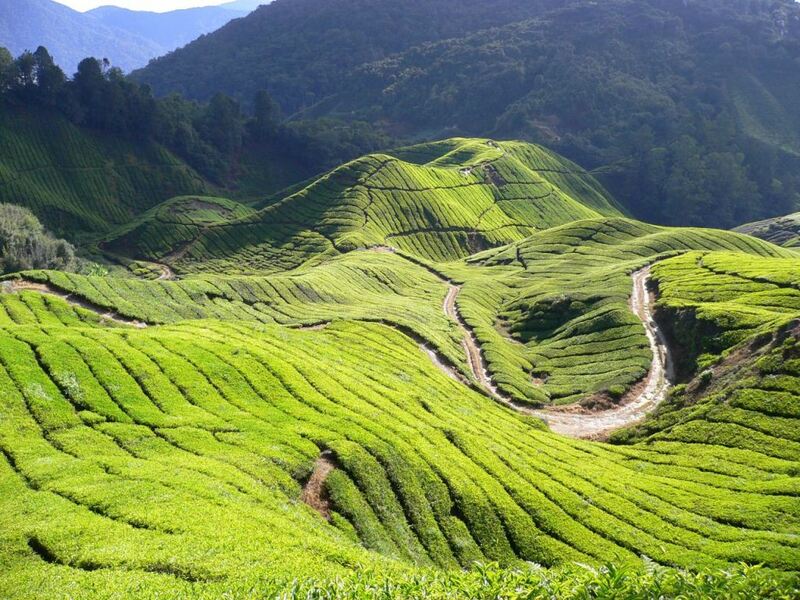 The Palas Tea Estate is another best tea estate to visit, located at Brinchang. Usually tours from Tuesday to Sunday at 11am. You can watch the entire process there, from picking to packing. The small, green leaves are picked every ten days or so using shears and wicker basket by the mainly Tamil workers who live on the estates. So, if you are an early riser, a visit to the tea plantation in the early morning will give you a glimpse of women waling between rows of tea bushes, picking the tender young tea leaves and throwing them into baskets strapped to their backs to be processed at the numerous tea processing factories around. All over the Cameron Highlands - but especially north of Brinchang - you'll pass small sheds or greenhouses by the roadside, selling cabbages, leeks, cauliflower, mushrooms and strawberries. These come from various fruit and vegetable farms, which thrive in the temperate climate. Over forty percent of the produce is for export to Singapore, Brunei and Hong Kong. 2km to the northwest, on the way to the Palas Tea Estate, you'll find the Robertson Rose Garden which open daily from 10am - 6pm. Have the free visit here which is rewarded by superb views of the sculpted sweep of the surrounding hills. Rose bushes aside; the shop here sells honey and cordials, as well as attractive dried flowers and arrangements. The Rose Centre Kea Farm, situated approximately 5 km from Brinchang & spread over 10 levels of terrace, is the coolest village & the biggest tourist center in Cameron Highlands. A Rose Museum is also built where you can gain a brief overview of roses & its history whereas children will be overwhelmed as they may make a friendly gesture with the animals on our Mini Zoo. Visit the strawberry park here will entail visitors not only to the opportunity to see how strawberries are cultivated but also offer the opportunity to purchase freshly picked strawberries with thick delicious fresh cream at affordable prices. Cameron Highlands's strawberries tend to be slightly smaller than those grown in Europe, probably due to a lack of long sunshine hours to promote growth, although they can be just as sweet and delicious. Most strawberries are sold to visitors as fresh fruit or jam, with the rest exported down to the lowlands. The Ee Feng Gu Farm is beautifully landscaped with flowering plants and various fruit trees.It covers everything on bees and has a range of bee products for sale. About 5km from Brinchang Town, The Ee Feng Gu Farm covers area 3.5 hectares. Bees are found in their natural habitat here. At 6,000 feet above sea level, Cameron Highlands is home to a number of birds and insects not found in the lowlands. A selection of the unusual butterflies, moths and insects indigenous to the area can be found at Butterfly Garden and Butterfly Farm in the Green Cow area. The Butterfly Farm located 5 km north of Brinchang, which open daily from 8am - 6pm, scores of butterflies fly free among the flowers, with the sound of running water from an artificial pond in the background. There are plenty of jungle walks to satisfy nature lovers. Two of them lead to the popular Parit Waterfall and Robinson Waterfall near Tanah Rata. Maps showing the trails are available at many of the shops and most hotels. If you're fit and love nature, a trip to the mountains should be on the agenda. The peaks offer magnificent views of the highlands. Maps are available for the more common routes. For the more adventurous there are other less well-known mountains but a guide is recommended on these journeys. Located in Cameron Highlands, Pahang, Cactus Valley is one of the biggest and most popular tourist destination located here. The valley boast of having one of the most variety of cactus plants, some as old as 60 years. Cactus Valley also have the most comprehensive variety of plants and foliage including roses, calla lily impatiens, fuchsia, ananas, camellia, hibiscus, rhododendron, bird of paradise, glory bush, clivia miniata, peaches, hippeastrum, geranium, coleus, gerbera, oncidium and many other. Varieties of apple trees, passion fruit plants are also cultivated here. These items planted here are also available for sale. The entrance fee is RM4 for adults and RM2 for children. There is no charge for cameras. They will probably also give discounts for older folks or for tour groups. The bulk of the C&S plants form an impressive collection. There is also a retail section. Most specimens are grown in pots. Strawberries, tomatoes and vegetables are also grown in the vicinity. Most of the gift and souvenir shops are along the Tanah Rata main street. Items tend to be based around anything to do with Cameron Highlands, everything from highlands tea to Asli Craft woodcarvings. The best of these are probably Yung Seng Souvenir Shop for their range of Asli Craft and the nicely presented Roslane Gift Shop. Most of the hill resorts in the highlands also have gifts and souvenirs. K.S. One Stop Shopping Centre in Brinchang is full of everything imaginable a visitor or local may need, from colourful sweaters to keep out the chilly evenings, to harmonicas and a complete range of Liverpool football kits! Kumar, who's helpful, meticulously cares it for and entertaining personality can in itself make a visit worthwhile. A delightful variety of food is available at hotels, restaurants and street stalls providing Indian, Chinese, Malay and Western food. They range from inexpensive fast service places, to pleasantly decorated first floor establishments ideal for a leisurely evening meal. There are far too many to mention here, just wander along the old main street and the new centre to make your choice. Dining out in Brinchang is a little more limited than Tanah Rata with most of the restaurants in the area serving various styles of Chinese food. Most Chinese restaurants offer a wide selection of dishes or your may opt for the very popular "Steamboat" with the food cooked in a steaming soup. Bite size pieces of fish, chicken, seafood and vegetables are brought to the table, along with noodles and various sauces for dips. Diners place the pieces of meat in the soup and after a few minutes they are ready to eat. A small ladle is on hand to scoop the food from the soup. It is a great dish for those who enjoy a leisurely social dinner. Malay food is usually spicy and rich as galaxy of spices are used to give it its characteristic piquant flavour. The most important of these are "Belacan" (prawn paste), chilli, coriander, cumin, ginger root, lemon grass, tamarind, turmeric, saffron and star anise. All Indian cooking is characterised by used of spices to make its staple curries but is not always spicy. Dishes such as "Kurma" have a base of coconut milk. Yoghurt is also frequently used. In some restaurants, foods are severed on a banana leaf. Fish head curry is another popular favourite.